Light-rail train riders have been asking for months to have real-time schedule information posted on platforms. They have finally gotten their wish. 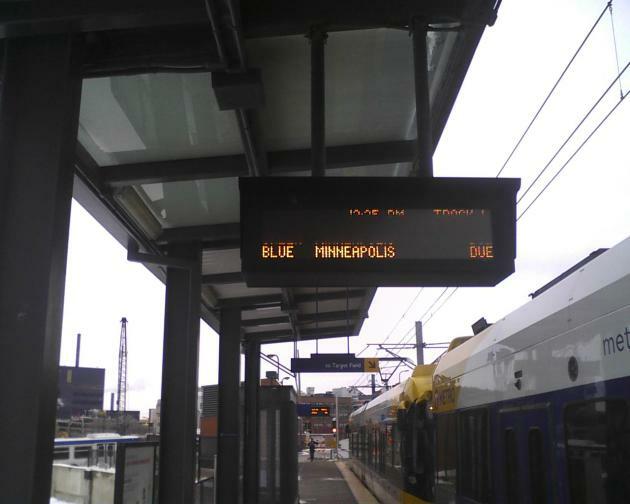 Late Wednesday afternoon, Metro Transit started posting the number of minutes until the arrival of the next Blue or Green Line train on electronic sign boards at all stations along both lines. Passengers will no longer see the "Please Check Schedules" message that has been appearing for months and aggravating riders. Riders noticed the change immediately and word rapidly spread through social media. "Glory Glory Hallelujah" tweeted Joe Totten. "It's just so beautiful," said Chris Iverson. Having real-time information appear on the signs has been in the plans ever since the Green Line began rolling in June, Metro Transit spokesman Howie Padilla said. "We know people have long been asking for this, and if it were as simple of flipping a switch, we would have had it long ago," he said. "They take lots of planning, and we wanted it as close to perfect before people saw it." Padilla noted that the system is still in a testing phase. On Thursday a few glitches were reported at the Mall of America and Union Depot stations. But overall, "things are running great," he said.